Importers have been advised to insure their goods with local insurance companies to reduce their costs of doing business at the ports of Ghana. 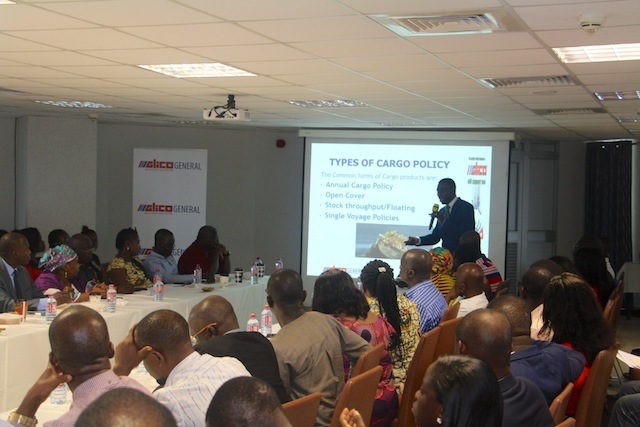 The Chief Operations Officer of GLICO General Insurance, Mr Solomon Twum Barima said importers would make savings in their businesses because the Ghana Revenue Authority (GRA)-Customs Division would use the same value of the insurance taken locally in Cost Insurance Freight (CIF) in calculating their import duties and levies. He gave the advice on 20th March, 2019 at a seminar organised for shippers during the first quarter meeting of the Greater Accra Regional Shipper Committee (GARSC) at the Ghana Shippers’ House. Mr Barima added that it was easier for importers to make cargo claims in Ghana since the local insurer is closer by to inspect any damage or losses. Additionally, importers also make savings by not remitting foreign exchange which come with bank charges to pay premiums. He advised the importers to remit the C&F values of their goods and pay the insurance in Ghana and later forward the certificate of insurance to Customs for calculation of duties and levies. The Chief Executive Officer of the Ghana Shippers’ Authority (GSA), Ms Benonita Bismarck reiterated the importance of insurance in shipping and encouraged the shippers to always insure their goods. She said it was important to build the capacity of local insurance companies because they bring significant benefits to shippers and Ghana as a whole. Per the Marine Insurance Act 2006 (Act 724), Section 37(1) (c), unless authorised by the National Insurance Commission, a person shall not enter into a contract of insurance with an offshore insurer in respect of goods, other than personal effects, being imported into the country. The National Insurance Commission and the Ghana Revenue Authority (GRA)-Customs Division are earnestly in talks to soon enforce Act 724 which would make it compulsory for all importers to locally insure their cargo without which they(cargo) can not be cleared. Representatives from over 70 companies including trade associations and bodies whose businesses affect the supply and demand of shipping services attended the seminar. The Greater Accra Regional Shipper Committee is one of the ten Regional Shipper Committees established by the Ghana Shippers’ Authority across the country to bring together shippers, shipping service providers, state agencies involved in trade facilitation and other stakeholders in the maritime industry to discuss pertinent issues affecting the industry and find solutions to them.